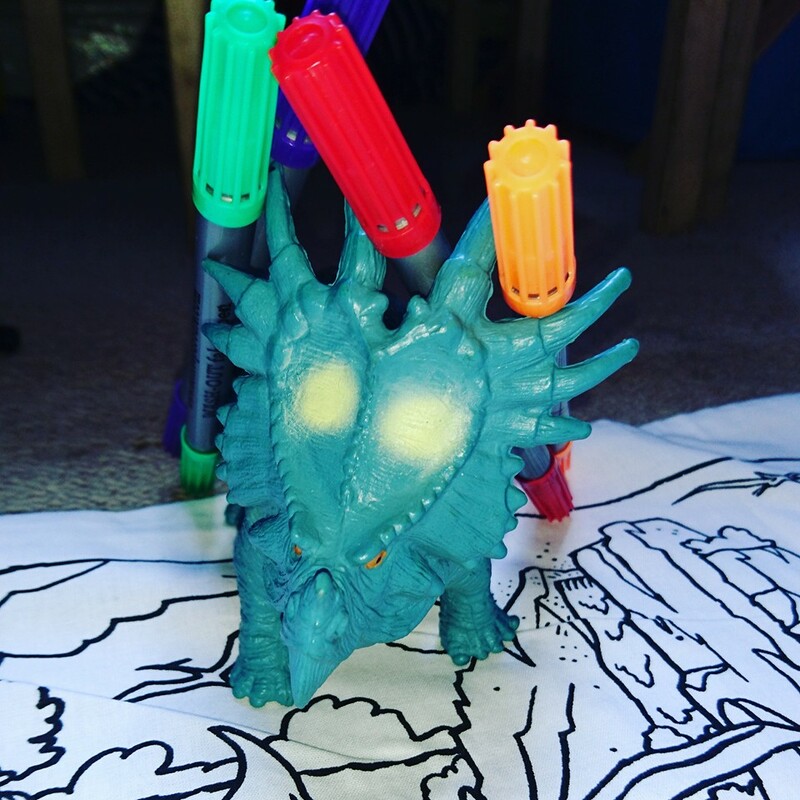 A few weeks ago we were sent a fun little product to enjoy from Eat Sleep Doodle. Eat Sleep Doodle have a range of products that you can colour in and draw on. As there name suggests their products include food related items, place-mats, aprons, cups and even a table cloth which I think would be great to have on a child's table at a wedding. They have backpack's and Ipad cases, sleep includes duvet covers and pillow cases. 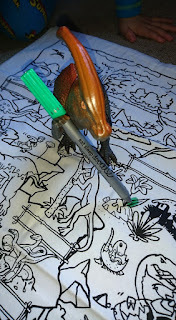 We were sent a Dinosaur pillow case, Jared-David is into Dinosaurs again so this was a great design for him. 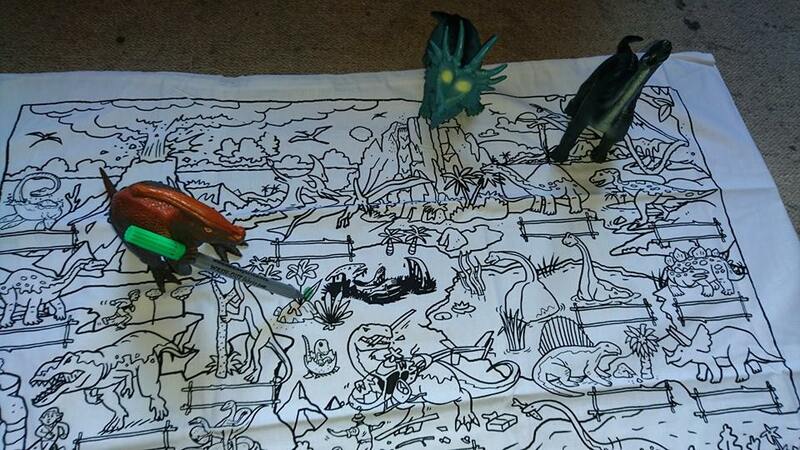 They have a notepad and a world map pillow case if your not a dinosaur lover. The packaging is small so if you were to order just one it should fit through your letter box with no problems. The pillow case is large in size (75x50cm) which is good as I was worried that if it was small that it would affect the detail on the case. Another concern of mine was that the material would be thin and feel as if it wouldn't last, but the material is made of 100% cotton and has a good strong feel. 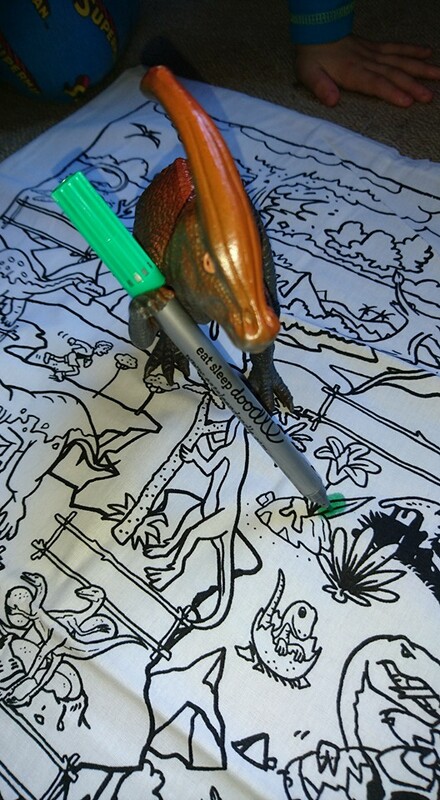 The pillow case comes with coloured wash out pens, a set of these pens can be bought from their website in case you fancy doodling on something that they don't yet have. The colours are basic colours and I think it would be good for them to have more of a selection and have them as additional sets which you could purchase separately. The pen's do wash out, I followed the instructions on the packaging on how to wash and would advise this to anyone who has one. 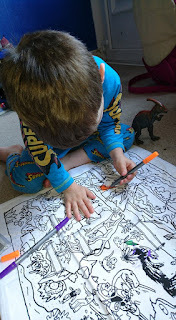 Jared-David really enjoyed colouring this in with the help of a few friends as you can see in the pictures. As well as this being really fun it helps with pencil control as I was setting him challenges to keep the colours in the lines. 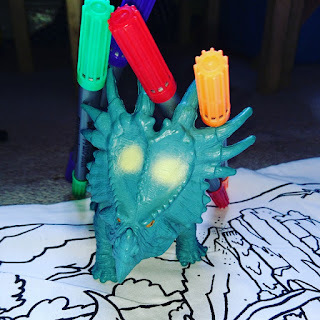 It also help to develop the imagination and story telling as Jared-David decided to play a few games with his dino helpers then create a story to tell me. I personally think this is a great product and it has helped with Jared-David not just in learning but also with going to bed better on a night time. 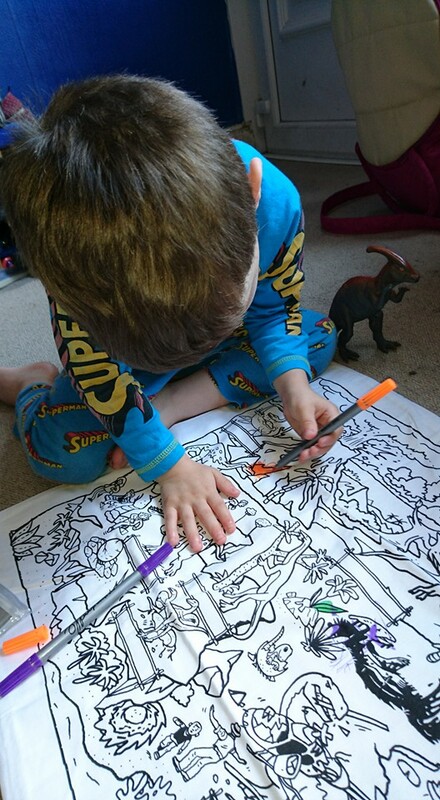 These would make a great gift for Christmas for any dinosaur lover little or big. 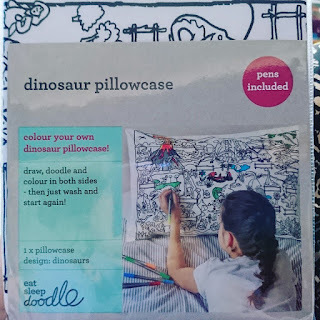 If the pillow case isn't your thing then have a look on their website as their are so many cool fun gifts to colour, and everyone loves colouring plus it is good for calming down and lowering blood pressure. 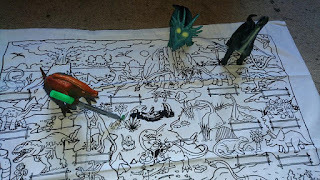 If you are feeling lucky or just fancy having your own dinosaur pillow case then I have a giveaway that will make 3 of you reading this very happy. Just enter the rafflecoptor below and keep your fingers crossed. Uk entries only, winners will be notified by email and have 28 days from the date shown on the email to claim the prize. If the prize hasn't been claimed after 28 days then another winner will be selected. Winners are selected at random via rafflecoptor. All incomplete entries will be disqualified. The giveaway runs from 30/09/2016 until the 30/10/2016.